Previously on Great British Bakeoff: The Bakewells went to France in pastry with canapés, Charlotte royale, and opera cakes. Beca was sent packing, while Kimberly took home Star Baker. Finals! And man, has this been in the news a lot lately or what? Between Raymond Blanc maybe spilling the beans and Paul Hollywood allegedly fancying Ruby (though he claims Kim’s more to his taste), I feel like there’s a new story every day. Do they really need the extra hype? VO tells us Ruby’s the wild card, Kim’s the steady and confident one, and Frances is creative. Just in case you’ve only tuned in for this one episode, I guess. Everyone gathers in the tent for the final signature challenge: a savoury picnic pie with some kind of design inside. I don’t even know how you’d manage to integrate a design into a pie of any kind. Paul tells us they chose this challenge because they want to see how well they handle pastry again, because the last time was a bit of a mixed bag. Frances is doing a rainbow picnic pie with rice, trout, and summer vegetables. When Mary hears about all that she’s packing into this pie, she looks a bit thrown, and perhaps a little grossed out. To stretch this episode out, it looks like we’re going to learn a bit more about all the Bakewells. Frances’s mum, Deirdre, tells us about how Frances used to make little cakes and things when she was a kid. And even then, she was a little quirky. Apparently, her parents have been her taste testers during the Bakeoff. Ruby’s making a pie to look like a picnic basket with tomatoes, couscous, halloumi, and herbs. She’s a bit stressed because she and Frances are both doing latticework on the top. She’s been practicing at her mum and dad’s house, and her mother’s looking forward to getting her kitchen back after all this is over. Mum interviews that Ruby never believes she’s done well enough. I’d believe that. Back in the tent, Ruby doesn’t think her pie dough looks quite right. Kim is doing three different colour pastries: white, green, and pink for her chicken and pig pie with pork pate, black pudding, and chicken mousse. She tells us she’s had two and a half catastrophes practicing this. How does one have half a catastrophe? In her real life, she has a rather cute boyfriend named Giuseppe. In the tent, she’s making some striped pastry, which looks pretty cool. The Bakewells line their tins with pastry and start on the fillings, trying to avoid the dreaded soggy bottom. Kim’s ingredients are all going into the pie raw, which is a risk because raw ingredients put off quite a bit of water. The other two are pre-cooking theirs. Everyone starts filling the pies. While Frances is busy at the microwave, Mary, Mel, and Sue steal some of her leftover asparagus, like naughty children. It’s actually pretty funny. Pies in the oven, and everyone sits back to wait. Kim’s comes out first, and she says it looks ok, though a bit juicy. The others come out as well and Sue cracks a bad joke about ‘hampering their progress.’ Wah wah. Though I appreciate even she realizes that’s a terrible joke. Kim’s is dripping as it comes out of the tin, so she pops it back in the oven for a few minutes to dry out. Frances adds some trimmings to make hers look like a picnic basket. The bottom of Kim’s starts to come apart as she moves it off the baking tray. Oh no! Frances’s is up first. Good bake, and it looks quite pretty. Paul observes that it’s really heavy. He cuts it in half and it’s got nice layers, though it might have done with a tiny bit longer in the oven. Mary says it’s been well seasoned, and Paul says the filling is fantastic, but the entire pie was just ten minutes from perfection. Kim’s chicken and pig pie is next. It doesn’t look great, I have to say. Not the outside, anyway, because there was just too much moisture. The inside looks nice, though. Again, Mary says it was seasoned well. Paul thinks the flavour’s just ok.
Ruby’s veggie picnic basket looks really pretty and has a very good bake, The layers inside are perfect and she exclaims that it never cut like that at home. Mary loves the pie and Paul calls it sublime and says she managed to come up with something that looks like Frances made it. Heh. One down, two to go. Technical challenge: pretzels! Wow, I could actually probably manage this—I make pretzels every week! They have to do six savoury and six sweet. Paul tells Mary they have to have a dense crumb and good dark colour. Ingredients are mixed and doughs kneaded. Ruby notes that it’s a very stiff dough, which is quite right. If it’s too wet, it’ll be too light and you’ll lose that dense texture. Mel asks Kim if she was a little frustrated with the earlier bake and is now taking it out on the dough. Hey, don’t knock it, kneading dough is a great way to work out aggression. The Bakewells start shaping their proved dough, and apparently only Kim actually knows what the hell a pretzel is supposed to look like. Oh, come on, you guys! What the hell? Frances is utterly clueless. And they actually have instructions on this part! Pretzels are boiled in a mixture of water and bicarbonate of soda, which gives the pretzel its shiny, brown crust. They only need to be in there for a little while, but it looks like Ruby may have left hers in too long. Pretzels are popped in the oven and the Bakewells start making toppings. There’s an orange glaze for the sweet orange and poppyseed pretzel. Some of the pretzels start coming out. Ruby’s are a bit overdone. Frances’s are a bit of a mess. Kim’s look ok. They paint on their topping, sprinkle some orange zest over the top, and put them in baskets for display. Paul and Mary come in, take a look, and start with Ruby’s. Paul notes the over boiling and says the flavour’s ok, but it’s not got that nice snap you want. Mary likes her sweet ones, though. Frances’s are misshapen and were boiled too long. Paul wants more colour on the savoury. Kim’s were the closest on shape and had the best colour. They’re nice and crispy and well baked. Yay! She looks relieved. Places, last to first: Frances, Ruby, Kim. No surprises there. Day two, time for the showstopper. The judges think Ruby is slightly in the lead, and they were a tiny bit disappointed in Kim, because they know she can do better than that pie. Frances is roughly at the same level as Kim. For their final showstopper, they have to do a three-tiered wedding cake. Off they go. Ingredients are weighed out. Frances has pineapples and, I think, treacle. She’s making a midsummer night’s dream wedding cake. The lower tier is rhubarb and ginger (yes, please! ), the middle is lemon, and the top a carrot, apricot, and orange cake. Seriously, give me that lower layer and I’ll be a happy girl. They’ll be decorated with hearts and things made from fruits and veggies. Kim’s using her cake pop mould to make raspberry spheres to put inside the chocolate fudge layer of her cake. Middle layer is orange and pistachio checkerboard sponge, and the top is a lemon and poppyseed cake. Mel asks her if she has someone particular in mind when she makes a cake like this and Kim admits that the bottom tier is her boyfriend’s favourite flavour and the top one is hers. Ruby can’t remember how long one of her tiers takes to cook, and she neglected to write it on her notes. Smart. Layers go in the oven, and they get started on fillings. Ruby’s doing both a lemon and a passionfruit curd for her victoria sponge, raspberry, and lemon cake. Sue asks Ruby what kind of cake she’d make for her own wedding and Ruby brats that weddings are just an exercise in narcissism. Screw you, Ruby. I saw my wedding as an opportunity to bring my loved ones together to celebrate a very big life step and have a great party. Also, putting your skills on show on a TV show is an exercise in narcissism too, so shut the hell up. Christ, she’s going to win and we’re going to keep seeing her all over the place for months to come, aren’t we? Layers start coming out. Frances’s are quite fragile, which is a tad problematic for a cake that has to support multiple tiers. Kim begins assembling her checkerboard, which apparently you do by putting different coloured rings of cake inside each other. While they toil in the tent, their family, friends, and former fellow competitors are partying it up at the traditional GBBO garden party. Glenn’s all excited to be back as a fan and Christine’s glad to not be a judge, because she has no idea how she’d manage that. Ruby’s last to take her sponges out of the oven and one of them loses quite a bit of a side as she removes it from a tin. She thinks it’ll be fine with plenty of buttercream. They start icing and stacking the layers, using dowels to add extra support to the structure. Ruby’s cut some of hers a bit too long and tries just sealing the gap with more frosting. Frances makes confetti and hearts out of rhubarb and pineapple and such. Kim’s got a stamp she had made with all different words for love, which she’s stamping around the outside of one of her layers. With 30 minutes to go, everyone starts to get pretty anxious. Kim thinks she’s behind, and Frances’s cake looks like it’s slumping. Also, the frosting work on hers looks rather sloppy. I’m surprised, she’s usually so fastidious. Time is called. Actually, none of these look great. Ruby’s has an unfinished look—she really needed to do some piping around the bases of the layers. Kim’s is pretty sloppy on the finish and the layers don’t look sharp at all. Ruby presents first. Paul is unimpressed with the three icing colours, because he doesn’t think they quite mesh well. Mary wishes some more skill was on show here. Flavour-wise, the passionfruit layer is delicious, but the raspberry is overbaked and dry. The bottom, lemon layer is ok, but Mary wanted a bit more lemon flavor and Paul says it’s overbaked again. Ruby tries not to burst into tears. They must all be completely sleep deprived and stressed all to hell at this point. Frances’s is so heavy Paul has to carry it up. The weight, hopefully, is mostly in the stand, which looks like a hunk of tree trunk. Mary wonders why there’s no decoration down the back, though she loves the rest of the decorations. Paul says it has a nice, contemporarary feel. So, is it supposed to be all slumped like that? Or am I just seeing it at a bad angle? The carrot layer’s icing is a bit too sweet, the victoria lemon sponge is moist and well baked, and the ginger and rhubarb is a nice ginger cake but the rhubarb doesn’t add anything to it. Finally, Kimberly. Mary is unimpressed with the decoration—she wanted to see a bit more skill on display. The lemon and poppyseed cake looks tempting and tastes great, the orange and pistachio checkerboard shows some nice skill and is well baked, and the chocolate fudge with raspberry spheres is a tiny bit dry but the flavours are still good. So, the inside was great, but the decoration was slightly lacking. The Bakewells head to the garden party, to the cheers and applause of all the attendees. Their families are all sitting at a table for each of them, which is sweet. Lots of hugs all around. Judging. They loved Ruby’s picnic pie, but she didn’t show much skill or precision on her cake. Frances’s flavours and outside were nice, so that’s good for her. Kim’s shown she was a brilliant baker, but the cake didn’t have the impact they were expecting from a wedding cake. Paul and Mary both have a winner in mind. Sue asks if it’s her and Mary teases that it might be Mel. Mel, Sue, Paul, and Mary appear at the party and are also applauded. Mel thanks everyone for coming and making the day lovelier. The three finalists are called forward and the winner is…Frances?! Woah, I really didn’t see that coming. And while I’m meanly glad that Ruby didn’t win, because she irked me so, I’m a wee bit befuddled by this one, because I wouldn’t say Frances was the strongest throughout the competition, or even today. Not by far. She was very hit or miss, really. Her pie was second, she was dead last in the technical, and the judges didn’t seem terribly impressed with her showstopper. Did we lose something in the editing? And the look of that wedding cake was not great. They all looked amateurish (yes, yes, I know that this is supposed to be a contest for the best amateur baker, but still), but hers was just really unimpressive. No wedding cake should look like a melting mountain of ice cream. Unless it’s purposely supposed to look like a melting mountain of ice cream. Paul claims that her showstopper was the best, and Mary says she has good flavours and great attention to detail. Ok. Kim and Ruby take the losses really well and all three women embrace, which is cute. 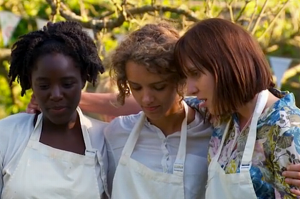 Since the GBBO, Toby has been running to raise money for cancer charities, Lucy has (of course) started writing articles encouraging people to grow their own ingredients, Mark has gone back to baking for friends and family, Deborah has been hoping to get involved in community projects to improve people’s confidence in the kitchen, Ali has been working with university baking societies to encourage Asian and Muslim men to bake (awesome, Ali! ), Rob is now working in chocolate a lot, Howard has given up on custards but has been getting a lot of requests to make cakes featuring Polar Bear Paul, Glenn continues to make giant cakes, Christine hosts a weekly baking spot on her local radio station, Beca is back to baking for her highly appreciative daughter, Ruby got a first in her exams and took a 48-hour baking break, Kim’s baking for charity and trying new recipes on her boxing club, and Frances is still kind of in shock and designing recipes with both style and substance.